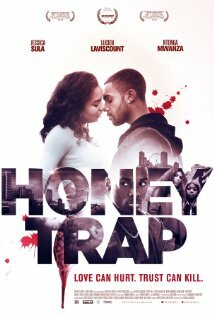 Movie Review: Rebecca Johnson’s “Honeytrap”, despite satisfying as a whole, struggles to attain a sustainable balance during its different sections, provoking mixed feelings when the script and its execution are confronted. If its story evinced great potentiality, the approach not always pulled off the most desirable results. Making a good use of the structure, in which the ends meet, the film follows Layla (Jessica Sula), a good-looking 15-year-old girl who moves to a small town located in the South London’s poor district of Brixton to live with her estranged mother. Even giving the sensation that she’s happy with the change, Layla doesn’t have the support and attention she needs at this crucial point of her life because her indifferent mother, Shiree (Naomi Ryan), shows no more availability than a few minutes of conversation when not in the nightclub where she works or in the company of some lousy boyfriend. When attending a new school, Layla is definitely not prepared to handle the brutality of a milieu where physical and psychological aggressions are a painful reality. Even though, there’s always someone friendly, which is the case of the good-natured Shaun (Ntonga Mwanza) who has true feelings for her. But the degrading scenario gets darker after she bumps into the vile Troy (Lucien Laviscount), a relatively successful rapper whose intentions are everything but pure. Domineering and authoritarian, Troy uses and abuses of the ‘blind’ Layla, whose uncontrolled passion, naivety, and submission will lead her to shame when she agrees to become his accomplice in a hideous crime. Before that, in a complete disorientation, she almost takes her life away when she finds out Troy's true nature. This is the kind of film that you can sense it’s going to end haplessly since its very beginning. The storytelling of Ms. Johnson, who was inspired by real-life events, reveals a sort of urgency in taking us to the despair of this teenager. It feels realistic most of the time, however, occasionally a few noticeable melodramatic moments, enhanced by the uninspired score, tend to push its mood to an objectionable side.